A complete lowfat meal in a casserole - chicken and rice in a creamy sauce with artichokes and water chestnuts for a little crunch. In a saucepan, combine the flour, chicken bouillon and milk until smooth. Bring to a boil, stirring constantly over medium heat. Cook for a few minutes, till thickened. Pour into a large bowl. Stir in the soup, yogurt and mayonnaise; blend to smooth. Stir in chicken, artichokes, water chestnuts, rice mix with seasoning packet, mushrooms, onion, celery, pimientos and pepper. Place in a baking dish (9"x13"x3")coated with butter or non-stick cooking spray. 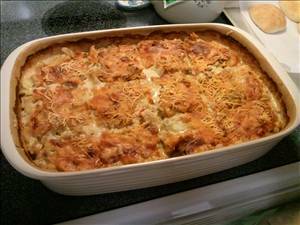 Sprinkle with a little flavored bread crumbs and lowfat cheddar cheese and bake for 60 minutes at 350 °F (175 °C). 105 members have added this recipe to their cookbook. A healthy paleo chicken dish. A healthier way to serve a favorite dip. Delicious tender chicken cooked in the crockpot. A delicious way to enjoy artichoke on the Fat Flush Plan. Chicken dipped in powdered spaghetti sauce with artichokes, mushrooms and onions. There are 200 calories in 1 serving of Chicken Artichoke Casserole with Rice. Calorie break-down: 25% fat, 41% carbs, 34% protein.